Everyone has heard of Mallorca, Corsica, Sardinia, and Sicily. But there’s another, oft-overlooked island in the Mediterranean. One so small that it goes by unnoticed on your average globe or map. The tiny island nation I’m speaking of is Malta, which is actually comprised of three separate islands, one smaller than the next. With only a few square miles to its name (122 total! 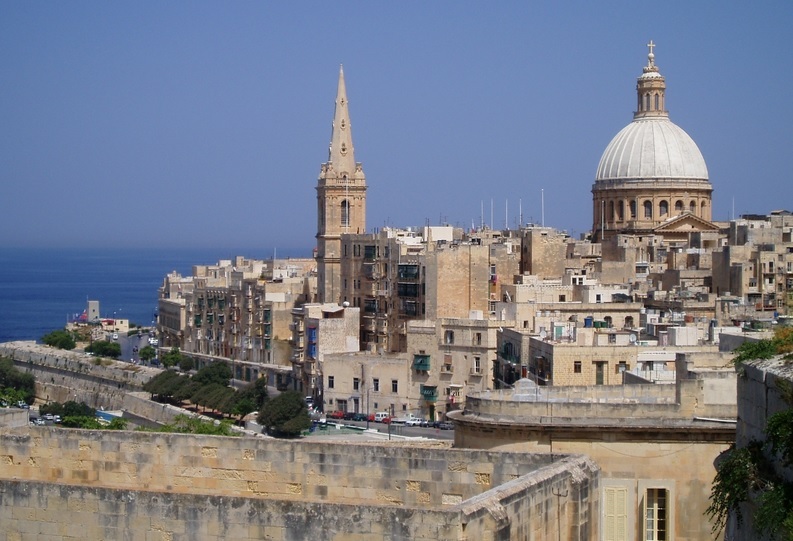 ), Malta comes through on history, character, and location- uniquely situated between Europe and North Africa. Valletta is a city borne out of a 16th Century need to house soldiers and to provide refuge from invaders. The charm of Malta is its continuity with the past; if you visit Valletta today, you will climb up and down bastions for a better view of the sea or go for a coffee in an old fortification structure. The narrow streets and uneven stone steps that take you from store to store are the same routes that took soldiers into a more recessed and impenetrable part of the city. While in Valletta, you will want to see St. John’s Co-Cathedral, St. James Cavalier Center for Creativity, and the Upper Barrakka Gardens. St. John’s interior is decorated with an impossibly intricate amount of golden baroque scenes. The chapels outdo each other in decadence, and Caravaggio’s ‘Beheading of John the Baptist’ will leave you with a sense of wonder. Go on to St. James Cavalier for a touch of modern culture in the way of theater, cinema, or an art showing. Then get some fresh air and a fantastic view from the Upper Barrakka Gardens’ terrace. Paceville is the place to go if you want a wide selection of bars… and a younger crowd. You can come here to shop during the day, but leave the nightlife to the high energy set. Meanwhile, St. Julian’s offers upscale accommodations and waterfront dining so you don’t have to leave this area even as night falls. Sliema also has travelers’ amenities, but there’s a more residential feel to the neighborhood. Come to Sliema for its rocky beaches, low key bars, and concentration of people enjoying the outdoors. If your idea of a party is to have cocktails on a boat, then visit nearby Ta’ Xbiex or Manoel Island to charter a yacht or take an evening harbor cruise. With churches and forts that pre-date Valletta’s, The Three Cities are truly the heart and soul of Malta. Like many historic and spiritual centers, The Three Cities often got less attention than the glitter of the sea, the ornate façade of new government buildings, or the robotic appeal of international brands’ storefronts. This works to the benefit of visitors to Cospicua, Senglea, and Vittoriosa who want to feel alone in their discovery of each turning passageway and every crumbled balustrade. Once you emerge from the other side of your secretive Three Cities meander, you can always hit the flashy new casino! The area may be a living history lesson, but it also knows how to have a good time!